We posted about the release of Havana Club’s latest edition, the fourth, of its Tributo collection back in March and were excited to be offered a sample for tasting. 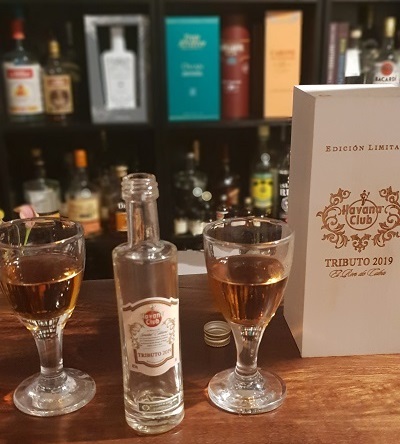 The blurb: The Tributo Collection is a series of limited editions and for the 2019 edition, three generations of Maestros del Ron Cubano (Masters of Cuban rum) came together to blend: Don José Navarro, Primer Maestro del Ron Cubano; Asbel Morales, Maestro del Ron Cubano; and Salomé Aleman, the first and only female Maestra del Ron Cubano. Each one of them selected a rare and extra-aged rum base, representing their own style, and the laid down in the decade of their appointment (1970s, 1990s, 2010s respectively). The bases, including one that has been matured in rare Cognac casks, were combined and finally blended again with a rum that has rested for over 25 years in French oak barrels. So far, it tells a good story, time to get cracking on the tasting. For this edition, it’s a tame 40% abv, there are 2,500 bottles released globally and the European retail price is €400, so a hefty outlay. The nose is promising and slightly belies the modest 40% strength. We got strong notes of cherry, pear drops and burnt caramel that gave a lot of vibrancy. It tones down a bit on the palate, however. There’s a bit of spice, slight bitterness of dark chocolate and the cognac fruitiness from the barrels is apparent. It’s a short finish and somewhat lacking in punch. Maybe that’s just our palates that have adapted to the higher ABVs and white agricoles that fill our shelves, but much like Steven over at the Rum Diaries Blog, we found it a bit disappointing taste-wise, which is obviously the major thing most of us ask for in a rum. We can see it being a hit with the rum and cigar crowd, though, an obvious Cuban selling point. Havana Club’s entry levels rums are still a good bet – the 3-year-old is a go-to for a flavourful, light cocktail rum, and their 7-year-old rum is also very approachable in term of flavour and price point. The Tributo at this price point, however, is unlikely to join our collection, maybe it would have been a different story if it was bottled at a higher ABV.